The beginnings of Jesus ministry point to his character as a servant. Both in his baptism and while resisting the Devil’s temptation, Jesus showed humility. This lesson teaches about those events and how children can also follow in his example. It is part 3 of the “Servanthood for Kids Series” we will be posting over the month of September. OBJECTIVE: To help students understand Jesus’ acts of service through his baptism and successful victory over Satan’s temptations. MAIN IDEA: Jesus clearly explained the reason for baptism and showed us how to resist the temptation to sin. When we follow his example, we grow stronger in our relationship with him. PREVIOUS LESSON REVIEW: Say, “Last week we learned about Jesus’ birth and childhood. What do you remember about his early life (e.g. he had brothers and sisters, he was the firstborn, he liked going to the temple and learning about God, etc)?” Remind the students that Jesus was a servant from the beginning of his life and they too can serve during their childhood years. BIRTHDAY CARDS: Obtain a list of birthdays for needy children in your community (such as foster children) or orphans living in another country. Bring blank birthday cards and writing instruments such as pens, pencils, or markers. Take time writing short messages and ask the students to sign each card. Say, “Sending birthday cards to needy children is an easy way to serve and share our faith with others.” Before dismissing, specifically pray that the recipients will accept Jesus as their Savior if they do not already know him. 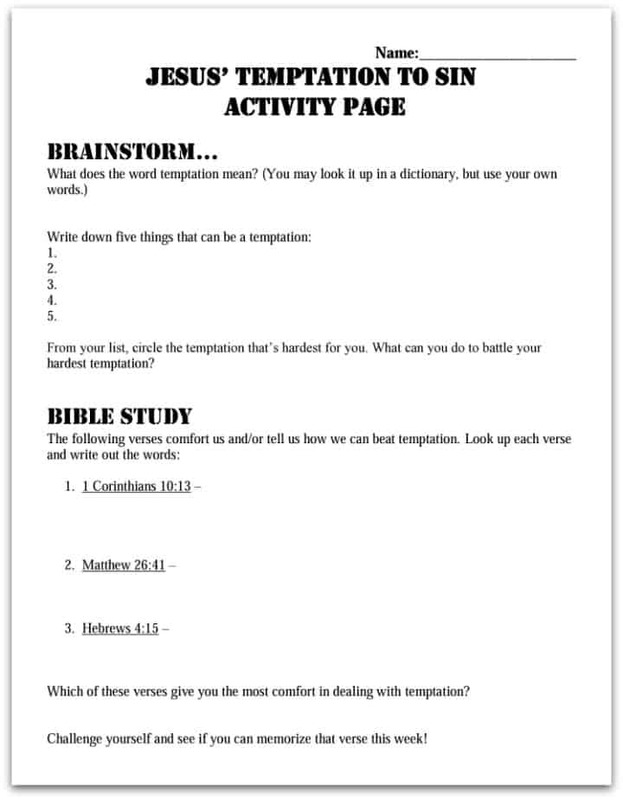 Pass out the “Jesus’ Temptation to Sin” activity page. Consider completing the “Brainstorm” section as a class. Reiterate that reviewing the information we learned helps us remember God’s word and prepare for victory over temptation. Ask students to complete the activity sheets at home if they are not finished by the end of class. RECAP: Jesus showed us that believer’s baptism is an act of obedience to God. Also, he showed us how to resist temptation by using God’s word and turning away from sin. Christ’s servant-like example through his baptism and victory over temptation gives us understanding and hope. Tony Kummer (Editor) reviewed & updated this page on : March 19, 2019 at 1:19 pm. All our content is peer reviewed by our readers, simply leave a comment on any post suggest an update.